For a composer who was a true rebel, a pioneering American maverick, John Cage was frequently celebrated in programs and festivals at the world’s most prestigious concert halls. Wednesday was Cage’s 100th birthday. For the occasion the fourth New York Chamber Music Festival, which runs for 10 days at Symphony Space on the Upper West Side, opened with an all-day celebration of “John Cage at 100!” The evening concert began with “Dawn at Stony Point, New York,” a sound recording from 1974, an inspired way to invite the audience that nearly filled the hall into the world of Cage. The recording consists of quiet sounds from cars whistling by in the distance, ambient street noise, crickets and chirping birds. “Everything we do is music,” Cage often said, a central tenet of his philosophy. The catch is that a piece like “Dawn at Stony Point” only works if the listeners get into a mind-set to hear it as music. Cage tried to foster that mind-set in his compositions. But his pieces need help from performers, which is what happened wonderfully here. As we listened to the recording, four percussionists from the Metropolitan Opera Orchestra (Charles Barbour, Robert Knopper, Duncan Patton and Gregory Zuber) sauntered one at a time onto the stage and took a seat on two couches. In front of them was a coffee table strewed with magazines, books, cups and various small items of wood and glass. Saying nothing, the performers just sat quietly, thumbing through the magazines, occasionally picking up and putting down some item from the table, which of course made sounds that became part of the piece. Then they segued smoothly into Cage’s “Living Room Music.” This 1940 piece has intricately notated, quite sophisticated rhythmic patterns, played here by the percussionists tapping small sticks on cups, glasses, household objects, magazines, cardboard, whatever. In one section, “Story,” the players spoke a line from Gertrude Stein (“Once upon a time the world was round and you could go on it around and around”), breaking it into rhythmic fragments, repeated words and syllables (“ti ti ti ti”), essentially using Stein as a prototype of rap. The performance was exhilarating and sweet. And the living-room setting was perfect. There was another arresting percussion piece, “Third Construction” from 1941. And for a performance of “Branches” (1976), the four Met players were joined by several more percussionists, stationed throughout the hall, including the balconies, to create a “surround sound” of delicate, restless, rippling percussion music. The program ended with a rare performance of “The City Wears a Slouch Hat,” a 30-minute radio play from 1942 with a text by Kenneth Patchen, a patchwork of snippets and stories from urban life. The play describes people wandering rainy city streets, ducking under awnings, being held up by robbers and telling tragic personal tales (that may be made up) to strangers. Morris Robinson performed a role called the Voice; Karen Beardsley Peters was Woman; Jon Burklund was Man, MC, Second and Third Voices. The text is full of aural references to street noise, telephones, ocean waves, falling rain and more. Cage backs the text with a varied and rhapsodic score of sound effects, played here by six percussionists. Of special interest was a short work from Cage’s early 20s, when he was exploring his own kind of music for 12 tones: the Sonata for Two Voices (1933), played by the violinist Cornelius Dufallo and the cellist Wendy Sutter. This skittish piece is the work of a young composer grappling with the modernist currents of his time. Yet even writing in this more formal language, Cage’s quirky mind and rhythmic inventiveness come through. The piece suggests another path he might have taken. Thankfully, he found his own way. I managed to break a way from the office to take in one of Cage's unique text-based pieces, "Lecture on the Weather" -- a setting of selected writings by Henry Thoreau, focusing primarily on issues of governance and democracy. Written in 1975 for twelve speakers with musical instruments, Cage had suggested the work be performed "preferably [by] American men who have become Canadian citizens" (in a nod to the post-Vietnam era). The title is certainly a nod to a "climate change" in American political culture, including the oft-maligned Weather Underground; Thoreau's writings were no less radical in their era than the views of many 1960s and '70s radicals, particularly antiwar activists. Cage would likely have been tickled by the dozen performers: prominent composers Ned Rorem, Joan Tower, David Amram, Jose Serebrier, Tania Leon, David del Tredici, Laura Kaminsky, Arturo O'Farrell, David Leisner, Sean Hickey, Jon Deak, and Noel Zahler. The "lecture" begins shortly after prerecorded sounds of nature and a rainstorm filled Symphony Space, followed by the composers entering in small groups and reading their parts. Visuals occasionally appeared for a few brief seconds at a time on a screen behind the performers, renderings of sketched symbols in white on a black background that suddenly flashed, strobed, or turned black-on-white. The musical "intrusions" are notated into the texts, and the variety of instruments on the stage -- from Jon Deak's double bass on the bottom of the musical range to David Amram's and Sean Hickey's recorders on the top -- would emerge with aural commentary both tonal and abstract. The twelve voices formed an aural panoply from which words would occasionally pop out of the texture -- almost all of which referenced government ("Democracy"... "legislature"... "representative"...). At about the midpoint of the half-hour performance, the performers slowly united in a not-quite-tonal, inventively irreverent rendition of "Happy Birthday." As the work approached its end, sounds of thunder from the prerecorded "background" acted as an ominous coda. In a year of tributes to Cage, this was far and away one of the most memorable, harnessing Cage's maverick spirit with humor and the feel of a "happening." NEW YORK—Part of the 4th New York Chamber Music Festival was the delightful and elegant concert by violinist Gary Levinson and his accompanist, pianist Daredjan Baya Kakouberi, on Sept. 9. After the two musicians took their places onstage at Symphony Space’s Peter Jay Sharp Theatre, on the Upper West Side, Mr. Levinson began with Ernest Chausson’s “Poeme,” playing with both delicacy and ardor. His tone was lush, as is to be expected since he performs on a 1726 Antonio Stradivari violin (loaned to him by the Dallas Symphony Association). The choice of pieces on the program indicated great versatility on the part of Mr. Levinson, as we were later to be treated to works by such varied composers as Prokofiev, Beethoven, and Ravel. Mr. Levinson performed the Prokofiev “Sonata for Violin and Piano No. 1 Op. 80 in F Minor” with passion and verve, the Andante assai flowing effortlessly to the Allegro brusco, then to the andante, and finally the Allegressimo. The performer does not resort to flamboyancy, as do some other artists. His approach stresses the music, in a pure sense. One can arguably hear it better that way. It must be said that Levinson is an attractive figure on stage, dressed simply in a black suit, Ms. Kakouberi in a subdued but appealing gown. After a brief intermission, Prokofiev was again the order of the day, featuring “Five Melodies Op. 35bis.” The two performers gave a lovely, sensitive rendition of this not so-well- known piece by the noted Russian composer. Ludwig van Beethoven’s “Sonata for Violin and Piano No. 9,” commonly known as the “Kreutzer Sonata,” is a major work, and Mr. Levinson and accompanist Miss Kakouberi accorded it their full technical and emotional skills. The piece is exceptionally long, approximately 40 minutes, and has a particularly demanding violin part, with movements featuring a placid approach, followed by greater liveliness, then a darker level, then a slower and more dramatic quality, and ultimately a burst of passion and speed in the final Presto movement. The performers acquitted themselves so favorably that when they had finished shouts of “Bravo!” came from the audience. To cap the performance was Maurice Ravel’s “Tzigane.” The French composer, noted for his melodies and texture of tone, here portrayed Gypsy musical themes. It was a delightful close to the afternoon, and beautifully played by the two musicians. Mr. Levinson was chosen by conductor Zubin Mehta to join the New York Philharmonic at an early age. He went on to earn top prizes at major international competitions. He has recorded CDs of the complete Beethoven sonatas with Miss Kakouberi, and he also performs internationally with Eugenia Zuckerman and Adam Neiman as Trio Virtuosi. Miss Kakouberi has been awarded prizes at numerous competitions and has been soloist with various orchestras abroad. She made her Carnegie Hall debut in 2002 and will perform at Carnegie’s Weill Hall this fall. The New York Chamber Music Festival offers excellent programs and outstanding artists. Its president and artistic director, Elmira Darvarova, former concertmaster of the Metropolitan Opera Orchestra (the first woman concertmaster in the Met’s history), will perform at this season’s penultimate concert on Sept. 15. All performances are held at the Peter Jay Sharp Theatre at Symphony Space on the Upper West Side, 2537 Broadway at 95th Street. A week ago I wrote about it feeling like autumn because I had just started going to concerts again after a mostly eventless (pun intended) summer. Since then it’s been a non-stop rollercoaster ride of concerts, music-related receptions, and other meet and greets. The 2012-13 concert season is now officially underway. Two performances I attended over the weekend were particularly noteworthy in that they were both devoted exclusively to the music of living American composers and—in both instances—all of the composers were there and spoke to the audience. Although Moravec originally composed the song cycle Vita Brevis for tenor and piano in 2001, he re-arranged it for voice and piano trio in 2009 and that is how it was presented on Saturday night by Farley with Moravec behind the piano, joined by NYCMF’s President and CEO Elmira Darvarova on violin and Samuel Magill on cello. It’s a surprisingly uncommon combination—the only other work so scored that’s immediately coming to my mind is Rorem’s Auden Songs from 1989—but as Moravec pointed out in his comments to the audience it’s nice to be able to match long vocal notes with instruments that can sustain. Bolcom’s songs, like much of his music overall, were a mix of ravishingly prettiness (“Never More Will the Wind”) and over-the-top shenanigans (“The Digital Wonder Watch”). But the highlight of the evening for me was hearing the songs of David Leisner for which the composer served as accompanist on classical guitar, since he is one of today’s leading practitioners on the instrument. But his vocal writing is every bit as idiomatic as his guitar writing. I was particularly drawn to the last of his three settings of the poetry of James Tate in which the vocal melody is clothed in a series of ascending phrases whose meters keep shifting. And I was shocked to learn that his fascinating cycle of Emily Dickinson settings, Simple Songs, though composed thirty years ago have yet to be recorded commercially. Paul Moravec, William Bolcolm, David Leisner, Carole Farley, and Ned Rorem (left to right) back stage at Symphony Space following their concert of American art songs at Symphony Space. The New York Chamber Music Festival, now in its third year, takes up residence at Symphony Space just before the start of the formal concert season, when its core players -- members of the New York Philharmonic, the Metropolitan Opera Orchestra and a handful of soloists -- still have time on their hands. This year's festival opened on Sunday evening with a free three-hour program that commemorated the Sept. 11 attacks. There was more than music: between the performances poems were read (several about Sept. 11, but classics by Dickinson, Wordsworth and Emma Lazarus, too), and dignitaries (the Supreme Court Justice Sonia Sotomayor and the Rev. Al Sharpton Jr., among them) offered brief remembrances. The actor B. D. Wong was the host. The program began with the composer David Amram giving a penny-whistle reading of his own inventive ''Variations on 'Amazing Grace.' '' Mr. Amram also contributed a ruminative piano accompaniment to the poet Frank Messina's reading of his affecting ''Bicycle (for Juan Gutierrez, Delivery Boy).'' Elmira Darvarova, the violinist who directs the festival, and Tomoko Kanamaru, the pianist, gave a focused, energetic account of Lera Auerbach's alternately brash and introspective ''September 11'' Sonata No. 2 for Violin and Piano. Ms. Darvarova also presided over a couple of string quartets -- Laura Kaminsky's dark, Bartokian ''Transformations II: Music for a Changing World'' and the Barber Adagio. And she collaborated with the composer and bassist Jon Deak on his amusing children's piece, ''Mose, the Fireman, 1840,'' and with Mr. Deak, the hornist Howard Wall and the flutist Patricia Zuber on Justin Tokke's ''Remembrance,'' one of the more emotionally pointed premieres. Now in its second season, the New York Chamber Music Festival at Symphony Space has expanded impressively. In a seven-day run that began last Friday, the festival is offering 13 concerts, up from 6 last year. Among the performers are musicians from the New York Philharmonic and the Metropolitan Opera Orchestra, as well as several soloists and ensembles. The repertory includes a bit of everything: standard fare, rarities (piano quartets by Korngold and Joseph Marx), contemporary works and jazz transcriptions. New York Chamber Music Festival: The violinist Elmira Darvarova, the pianist Pascal Rogé and the cellist Samuel Magill in a concert of French music at Symphony Space. 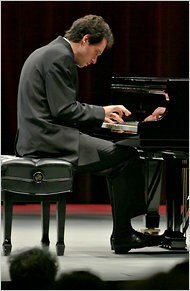 The pianist Pascal Rogé, one of the strongest draws on the roster, opened his Monday evening program of French music with an alluring oddity, Saint-Saëns’s Scherzo for Two Pianos (Op. 87), performed with his wife, Ami Rogé. Saint-Saëns gave both players plenty to do in this playful work: a long, shapely melody will sometimes leap between keyboards and sometimes sing on one while the other decorates it with sparkling filigree. An evocative chromaticism keeps the work’s harmonic core lively and slightly off kilter. Mr. Rogé was joined by Samuel Magill, the associate principal cellist at the Met, for a rendering of Poulenc’s Cello Sonata (Op. 143) that was admirable for its detailed and finely polished interplay and for the power and richness that both musicians brought to the plangent finale. But that opulence was long in coming. In the work’s first three movements, Mr. Magill clothed his otherwise unimpeachable reading in a dry sound that seemed all the more colorless when set against Mr. Rogé’s more vivid playing. No such complaints could be lodged against Elmira Darvarova, who played Debussy’s Violin Sonata. Ms. Darvarova, a former concertmaster at the Met and the director of the festival, couched this colorful score in a sweet, flexible tone and reacted deftly to Debussy’s idiosyncratic character shifts, like the leap from Gallic urbanity to a lively flamenco figure at the end of the first movement. She also gave an admirably speedy but clearly articulated account of the finale. Though Mr. Rogé proved an adept and considerate chamber player, he was most fully in his element in the Ravel Sonatine, the only solo work on the program. Using a touch that combined gracefulness and power, Mr. Rogé gave the score a supple reading in which Ravel’s right-hand melodies floated freely and with an almost songlike quality over the accompanying figuration, and in which even the densest rolling figuration had an inviting transparency. In the finale, particularly, he gave the music an organic ebb and flow. To close the program, Mr. Rogé, Ms. Darvarova and Mr. Magill gave a fluid, finely balanced and sharply accented performance of Ravel’s Piano Trio. The New York Chamber Music Festival runs through Thursday at Symphony Space, 2537 Broadway, at 95th Street; (212) 864-5400, symphonyspace.org. The accomplished young Israeli pianist Shai Wosner, who performs regularly with chamber music ensembles in the United States and Europe, has a new recording that fascinatingly juxtaposes works by Brahms and Schoenberg. On Wednesday at Symphony Space, as part of the weeklong New York Chamber Music Festival, Mr. Wosner again showed a knack for drawing connections between composers. Before the Mahler group, having just played the sonata, Mr. Wosner spoke about the links he saw between these seemingly disparate composers. The song genre was central to them, he said, and they shared powerful attachments to both the idyllic and the tragic realms of life. Mr. Wosner went further, playing themes and phrases from the sonata just heard and pointing out similar bits in the Mahler songs. He did not claim that Mahler was actually quoting Schubert, but the correspondences were striking. Mr. Wosner gave a lively and sensitive account of the demanding Schubert sonata. The buoyant first movement shifts between bursts of fanfarelike themes and rippling passagework. Though Mr. Wosner took a brisk tempo, his playing was lithe and articulate. The breathless energy of his conception was captivating, though he could occasionally have taken just a moment extra to set up the next episode or phrase. The second movement is marked Con Moto (With Motion), and Mr. Wosner played it that way: though he was always sensitive to passages of harmonic and expressive intensity, his ambling pace never allowed the poignancy to take over. He deftly dispatched the feisty scherzo and ended with a supple account of the dancing rondo, played with impressive lightness and clarity. Ms. Yu’s lyric soprano voice is light and youthful, yet its warmth and creamy richness make it well suited to Mahler. The resonances of Schubert in the Mahler songs came through vividly in these original versions for voice and piano. Most of the Mahler songs, including these six from “Des Knaben Wunderhorn,” are best known from their orchestrated versions. Ms. Yu and Mr. Wosner ended with “Das himmlische Leben,” widely familiar as the final movement of Mahler’s Fourth Symphony. Increasingly, I find the versions for voice and piano more direct, subtle and intimate, especially in performances as beautiful as this one. The "official" music season usually does not start in New York until a couple of weeks after Labor Day, but there is still plenty to see and hear -- and one of the best places to jump the gun is at Symphony Space, where the New York Chamber Music Festival has already launched their second season. Artistic and Executive Director Elmira Darvarova and her circle of artistic collaborators have again assembled a wide-ranging series of programs spanning a broad range of chamber repertoire. Slower-than-expected recuperation from nose surgery forceded me to beg off the first few events in the festival, including performances by cellist Christine Walevska and New York Philharmonic principal trumpet Philip Smith, but I loaded up on analgesics late Monday afternoon in preparation for a program of French chamber and piano music featuring Pascal Rogé. He is best known on this side of the Atlantic for his deservedly acclaimed recordings of French piano music for Decca, but I also like his more recent recordings for Onyx and Oehms, particularly the Gershwin and Ravel concerto SACDs on the latter label with the RSO Wien conducted by Bertrand de Billy providing idiomatic, spirited accompaniment. Symphony Space is, to be polite, not exactly the most richly reverberant venue in Manhattan; the front rows provide an intimate atmosphere with good sightlines, though the acoustics favor players further back on stage. The program opened with Saint-Saëns's charming Scherzo for Two Pianos, Op.87, with Rogé's wife Ami on second piano. This is music with one foot unashamedly in the salon and the the other in the conservatory. Saint-Saëns's detractors often carp about his music's superficiality, but with the Rogés at the keyboard it is impossible not to succumb to this music's charming melodies and balance of craftsmanship and wit. Poulenc's Cello Sonata, written in the late 1940s, is slightly craggier than his earlier solo sonatas and chamber music, but retains the composer's charming style that is infused with just a touch of the Parisian music hall and jazz. Cellist Samuel Magill's lean sound and Rogé's rich palette sometimes seemed at odds, but did serve to shine a spotlight on the hairpin-turn changes in timbre and articulation. In the second movement Cavatine and the Finale, sets of themes sounded strikingly as if they could have been lifted from the chamber music of Prokofiev -- then instantly morphed back into something unmistakably French. Darvarova and Rogé took an equally daring approach to Debussy's Violin Sonata. Stripped of romantic trappings and sentiment, Darvarova conjured an amazing array of timbres and sounds, consistently punctuated and supported by Rogé's transparent and dynamic pianism. The work seemed more a gateway to Messiaen and an avant-garde generation to come than a culmination of Debussy's oeuvre. Don't let the title "Sonatine" fool you -- Maurice Ravel's short three-movement work opened the second half of the recital with an abundance of energy and color, distilling the composer's piano oeuvre into a pointed and compelling work. Rogé delivered the final Animé with a particularly impressive balance of color and pianistic control, unfolding with irresistable momentum in almost a single phrase. The program concluded with a strongly expressive and, as with the Debussy, forward-looking vision of Ravel's enormously demanding Trio. The unanimity of Rogé, Darvarova and Magill was impressive, as was the clear but unexaggerated use of string instrument timbre. I can't recall hearing the Passacaille played with this much potency, and the daunting Finale generated not only goosebumps but an enormous -- and gratifyingly warm -- volume of sound. The festival has scored a real coup with the participation of Pascal Rogé. He will be one of the performers in tonight's program, including woirks by Schumann, Brahms, David Amram and Paul Chihara. Miss it at your own peril! Symphony Space is presenting its first New York Chamber Music Festival, a six-concert series that began on Sunday afternoon with Principal Brass, a quintet (four principals and one associate principal) from the New York Philharmonic. The program was fairly light: at the end of the concert, Philip Smith, the orchestra’s principal trumpeter and the chatty master of ceremonies here, saluted the Canadian Brass for transforming quintet performances into entertainment, and added his hope that this Philharmonic ensemble had done so as well. There was no visible sign of dissent from Mr. Smith’s colleagues, Matthew Muckey, the associate principal trumpeter; Philip Myers, the hornist; Joseph Alessi, the trombonist; and Alan Baer, the tuba player. To that end, the group devoted its program mostly to transcriptions — Baroque favorites, jazz tunes and movements from Leonard Bernstein’s “West Side Story” — with a couple of pieces composed for brass tucked into the first half like stowaways. Not surprisingly, those scores worked best. The Intermezzo from Ingolf Dahl’s “Music for Brass Instruments” (1944) was given a bright-hued, energetic performance, and the fast movements of Malcolm Arnold’s first Quintet (1961) sizzled. The Chaconne at the heart of the Arnold was striking in a different way: in this slow movement the players were alert to the dynamic nuances and produced a finely balanced sound. They did so in some of the transcriptions too. “America,” from the “West Side Story” set, in a Jack Gale arrangement, was dazzling enough that you didn’t think much about the original orchestration. An Albinoni sonata, arranged by David Hickman, and the Sarabande from Bach’s Partita No. 1 for Unaccompanied Violin, in a transcription by Donald Rauschen, had a quirky appeal in brass timbres too. Others went less smoothly. The Bourée from the same Bach Partita and a movement from Handel’s “Royal Fireworks Music” (arranged by Chuck Seipp) had rhythmically flat-footed moments. And neither superb trumpet dialogues nor character-ful trombone playing was enough to save some of the jazz arrangements (most by Robert Elkjer) from seeming to plod rather than swing. The New York Chamber Music Festival continues through Sunday at Symphony Space. Rachel Barton Pine made her long overdue New York recital debut this evening at Symphony Space, in a program featuring works by Pisendel, Mendelssohn, Corigliano and Liszt with pianist Matthew Hagle. It was one of the finest recital programs I've seen in a very long time. Barton Pine is a scholarly and perceptive musician who has restored a number of neglected works to the repertoire, but rest assured: boring she is clearly not. She puts rigorous consideration into her approach to a broad spectrum of music (not limited to classical music, by the way – she also plays with phenomenal metal band Earthen Grave). Her interpretive approach to violin repertoire is at times reminiscent of the urbane approach one associates with Kreisler and Gingold — but she also delivers virtuoso pyrotechnics that are unusually nuanced. She's found a sympathetic and formidable partner in Hagle. I was impressed by their remarkable musical unanimity, and their remarkable unity and control during striking tempo changes – particularly the fleet accelerandos in the sixteenth-note figurations that grace the opening Allegro vivace of Mendelssohn's F Major Sonata and the adrenalized tempo shifts in the finale of the Corigliano Sonata. Barton Pine brought out the baroque grandeur of Pisendel's solo Sonata in a minor, which not only has much in common with his contemporary Bach but a central Allegro that evokes the sound of Northern Italian baroque string works. Liszt's Hungarian Rhapsody No.2 concluded the program, with Barton Pine and Hagle finding an ideal balance between the concert hall and gypsy camp. Barton Pine introduced each piece from the stage, combining musical background with her own observations — and providing a few shout-outs to her home town of Chicago, where local classical radio station WFMT was broadcasting and streaming the event live. Barton Pine and Hagle received sustained and enthusiastic ovations – including uncustomary applause after the first movements of the Mendelssohn and Corigliano, from an audience filled with more than a few well-known New York musicians. The recital was the third in the newly established New York Chamber Music Festival, which runs through September 20th at Symphony Space. The festival's executive and artistic director, Elmira Darvarova, and her outstanding team deserve congratulations and gratitude not only for this debut recital coup but a superb lineup of programs. Darvarova is herself an excellent violinist, and she will be performing tomorrow night and Thursday with a number of other superb musicians; the festival concludes Sunday with a recital by cellist Antonio Lysy and pianist Pascal Rogé. While the rest of the music press in town is obsessing over the opening of the New York Philharmonic season under new music director Alan Gilbert, it's a sure bet that the attendees at this evening's recital will tell you the new season is already off to a rousing start. The violinist Rachel Barton Pine has recorded plentifully and has performed in New York several times as a chamber player, most notably at the Frick Collection with Trio Settecento, her period-instrument group, in 2006. The program on that occasion was a set of Baroque trio sonatas in which the violin held the spotlight most of the time. But it turns out that Ms. Pine had never played a traditional recital here, the kind with just piano accompaniment (or none) and with a program that ranges across a few centuries and style. She rectified that omission on Tuesday evening with a recital at Symphony Space as part of the hall’s New York Chamber Music Festival. Because Ms. Pine is a star in Chicago, her hometown, the concert was broadcast live on WFMT, Chicago’s principal classical music station, with the radio personality William McGlaughlin as the host and, unaccountably, a permanent stage fixture. Though he did not conduct an interview with Ms. Pine or introduce the works (Ms. Pine did that herself), Mr. McGlaughlin sat at a table on the stage through both halves of the program, sometimes writing or drinking water. Was that absolutely necessary? Ms. Pine began where her Frick performance had left off, in the heart of the Baroque, with a Sonata in A minor for Unaccompanied Violin (1717) by Johann Georg Pisendel, a contemporary of Bach and a kindred spirit. Like Bach, Pisendel provided a single line of music, phrased in ways that invite a player to create the illusion of counterpoint. Ms. Pine accomplished that with deftly shifting articulation and color. You may have wished, all the same, that she had played Bach instead, but Ms. Pine made a valiant case for Pisendel as a reasonable alternative. She was joined for the rest of the program by Matthew Hagle, a sensitive pianist who knew when to defer, and when deference would be counterproductive. They proved a well-matched duo in Mendelssohn’s Sonata in F (1838), which gives both players singing lines as well as sparkling, brisk figuration. But it took them a few moments to find common ground. Ms. Pine’s phrasing was oddly breathless at first and seemed to push against Mr. Hagle’s more settled pace. She found her bearings by the end of the first movement. In the central Adagio she played with a warm tone that stopped just short of lugubriousness, an approach that set up the sizzling finale perfectly. Ms. Pine recalibrated only slightly for John Corigliano’s Sonata (1963), a neo-Romantic work that thrives on melody, but uses chromaticism freely to give its tunes both a modern cast and a touch of unpredictability. It has stood up remarkably well: having weathered a period when consonance was suspect, it seems prescient now that a generation of composers have adopted Mr. Corigliano’s eclecticism. The New York Chamber Music Festival runs through Sunday at Symphony Space. After rousing performances last night by violinist Rachel Barton Pine and pianist Matthew Hagle, the New York Chamber Music Festival continues at Symphony Space. Tonight, a Beethoven string trio shares the bill with a more modern string trio by Eugene Ysaye (1858-1931), a piano quartet by Charles-Marie Widor (1844-1937) and “Metamorphosis for Violin, Viola, Cello and Piano” by Gernot Wolfgang (born 1957). Violinist Elmira Darvarova, violist Ronald Carbone, cellist Samuel Magill and pianist Linda Hall will perform. Thursday’s program offers work by two 20th century composers, Franco Alfano (1875-1954) and Vernon Duke (1903-1969)—performed by violinist Elmira Darvarova, cellist Samuel Magill, and pianist Scott Dunn. Sunday, the final night of the festival, features chamber works by Johannes Brahms (1833-1897), Claude Debussy (1862-1918), Osvaldo Golijov (born 1960), Lalo Schifrin (born 1932) and Astor Piazzolla (1921-1992). Cellist Antonio Lysy will be making his New York debut, in a joint concert with pianist Pascal Rogé. This is the inaugural season for the festival, directed by violinist Elmira Darvarova, formerly the concert master of the Metropolitan Opera Orchestra. Judging by last night’s wonderful concert, the New York Chamber Music Festival is a valuable addition to the cultural life of the Upper West Side. If music be the food of love, life—or even a great Wednesday night on Upper Broadway--play on! In his excellent notes, cellist Samuel Magill describes Toscanini conducting the world premiere of Turandot, and the conductor's curt dismissal of Franco Alfano's completion of the opera's final act: "On opening night at La Scala in 1926, Toscanini stopped conducting where Puccini's music ended and Alfano's began, and abruptly left the orchestra pit. This incident had a lot to do with damaging Alfano's career and ensuring his falling into obscurity after his death."? ?So fast-forward to the 21st century, when there appears to be a bit of an Alfano revival afoot. In 2005 the Metropolitan Opera staged his Cyrano de Bergerac, which I thought was an underrated gem, at least on one viewing. And now, in conjunction with their new recording of two of Alfano's chamber works, Magill and his superb colleagues, violinist Elmira Darvarova and pianist Scott Dunn, performed them at Symphony Space.